Peter Drucker once said the only purpose of a business is to make and keep a customer. For the past decade, software companies have been pretty good at tackling the first half of Drucker’s statement – how can we get as many customers as possible to use our product? The next ten years will be defined by the latter – now that we’ve got these customers, how the hell can we get them to stick around? A cool new messaging app getting to 1m users is the new normal. Keeping them, and getting to 100m, is the question. Hiten Shah wrote an excellent piece recently about the growing challenges of customer retention. Increased competition, low switching costs and cheaper distribution has meant the cost of keeping customers is starting to far exceed the cost of acquiring them, citing our platform approach as one of the ways SaaS product can increase retention. Hiten’s piece looks at how your product can foster retention there are more immediate tactics that can help with customer retention. Although retention programs can take startups years to develop (if you want to get started, Des wrote an excellent primer on calculating your retention rate) there are some very basic measures you can take today to kickstart yours, and start growing your active userbase. Gamification, hacks, and promotions can all have great short term effects, but one thing that tends to work very well is lifecycle messaging: contacting users with messages that they will get value out of, based on their actual experience of using your software. For example, you could imagine a project management app sending a “Getting Started” guide to someone who had not created a project after a week, but also sending a “How To Work With A Remote Freelancer” guide to someone who is actively using the product in a particular way in the weeks following that. Best of all, to create these message schedules you don’t need a “retention hacker”. You definitely don’t need a “retentioneer”. All you need is a few hours to create a simple series of messages that will pay back many times over. The path from new user to power user is a circuitous one. It’s a series of fragmented moments that doesn’t always occur in a predictable order or according to a timetable. Pretty complicated, right? The best part of breaking retention down like this is that while you must keep the overall goal of success in mind, you only have to solve for one stage at a time. This makes creating those lifecycle messages easier, more targeted and subsequently much more effective. Most of your churn happens in the first seven days; it’s the nature of the beast. People get curious, kick the tires, shrug their shoulders and leave without saying goodbye. That’s why when someone signs up to your product, it’s important to make sure they’re seeing the value of your product right away. In software it’s called the “aha moment”. It’s the moment when the value of your product becomes crystal clear to the user. They say, “Ah, now I get it!”. New users can only get value from your product by performing valuable activities. For Facebook, it’s getting new users to add 7 friends in 10 days. 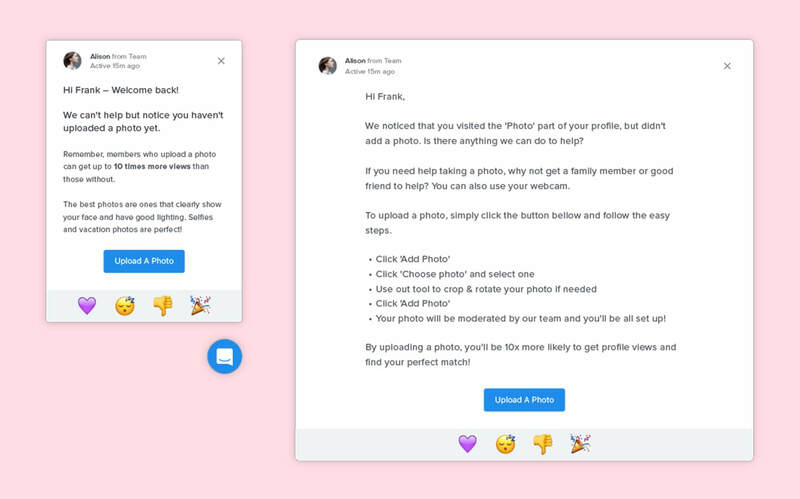 For Dropbox, it’s getting new signups to put one file in one Dropbox folder. Your most committed and diligent customers will do this by themselves, but many others will require a little nudge, if not outright persuasion. And messaging is the highest leverage tool at your disposal here. Just look at this email Buffer sends to new users. Their browser extension makes it easier to share items you’ve found while browsing. 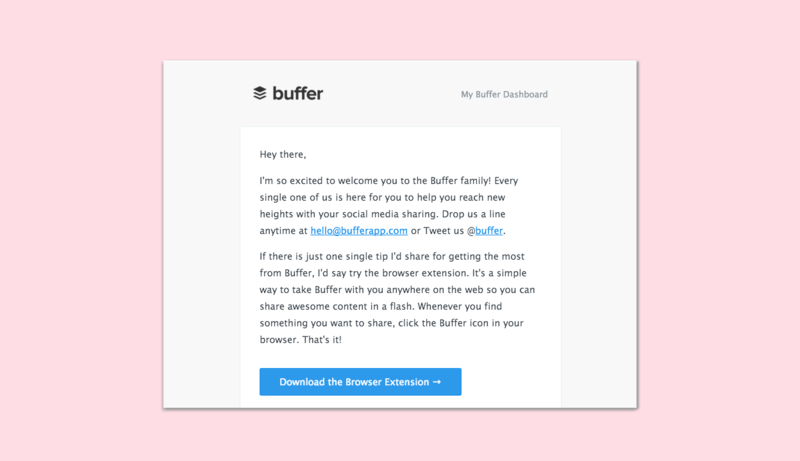 New users who fail to install the Buffer browser extension won’t share as much, they won’t experience the full value of the product, and are therefore more likely to churn. Getting new signups to perform one high value activity won’t guarantee a churn-resistant product, but it’s a much better place to start than the “let them come in, kick the tires, cross our fingers and hope they stay” philosophy employed by many SaaS businesses. Apple. Facebook. Twitter. Google. Pinterest. These companies all have one thing in common – they create habits among their users. If you’re like me, you probably use these products so much that it’s hard to imagine life before they existed. So how do you create these habits in your own product? If you haven’t already, I’d highly recommend reading Hooked: How to Build Habit-Forming Products by Nir Eyal. His research says every habit-forming loop begins with a trigger: the spur behind a new behavior. These triggers can take many forms, notifications, reminders etc – but emails and in-app messages work particularly well. Take this example from White Label Dating. As a dating website, if someone doesn’t keep an up-to-date profile, they stand a very poor chance of generating any romantic inquiries. Nobody falls in love with an anonymous avatar. So crafting an email (or, even better, an in-app) around getting people to do these important actions is a very, very good idea. No trigger, no action, no habit, no retention. Remember, the success of your triggers rely on going deeper than shallow notifications and nudges. Rather than sending an email with a flimsy command like, “You haven’t uploaded a photo yet – please come back!”, appeal to the value someone would receive out of doing so. Nobody is intrinsically motivated to complete their profiles or come back to the product itself – they’re motivated by what they can do and get out of it. Retention messaging won’t work without connecting back to the user’s intentions and goals. If you’re lucky enough to have developed a large cohort of power users, you might be tempted to give yourself a pat on the back and call it a day. Big mistake. Software is a dogfight. Unless you’re showing your users continued value, there’s always someone waiting to steal your lunch. There are many strategies to help you achieve this – gamification, retention hooks, rewards, milestones etc – but the most successful strategy I’ve come across are referral programs driven by, you guessed right, messaging. Popularised by Dropbox, referral programs might look like an acquisition strategy, but the benefit can go way beyond that. 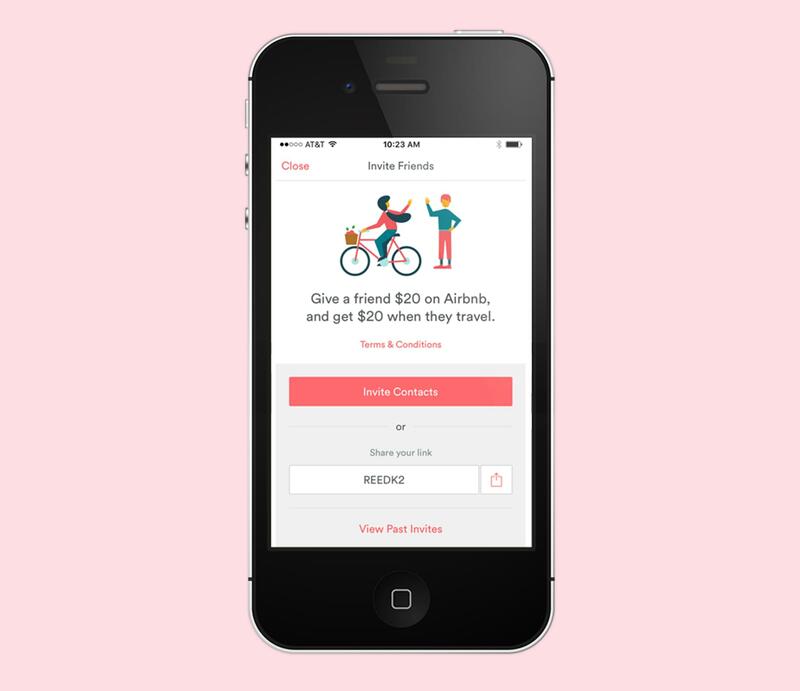 Take the below example from Airbnb. Trusty word of mouth referrals results in new users. Habits begin to form as groups of friends begin relying on the same product. Messages such as these encourage habit formation with existing customers, while simultaneously acquiring new customers who have a high probability of repeating the behaviour of your most valuable power users. Remember those halycon days when software was sold through licenses and you only had to win over each customer once to stay profitable? Those days are over. For today’s software businesses, you have to win over your customers month after month just to keep the lights on. If you’re really in it for the long haul, for customer retention and loyal users, then you should be throwing the kitchen sink at the people you care about the most: your users. No startup has ever died because they spent too much time talking to customers.